Handcrafted and American-made fry pan. 9"Dia. x 1.5"T or 11.5"Dia. 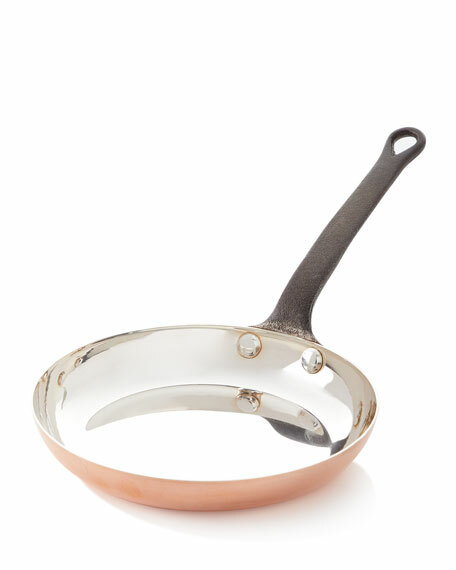 x 1.75"T.
Made with slightly thinner gauge copper for a lighter-weight pan, this piece is designed to move on the stove. Solid copper, silver lining and cast iron handles. Handcrafted stewing pan with lid. Soapstone and copper. Retains and propagates heat. Healthy and natural. Italian design. 11.8"Dia. x 3.9"T.
Courtly Check?? 1-quart saucepan. 12.5"W x 6.5"T. Hand-glazed, heavy-gauge steel with hand-painted Courtly Checks. Intricately detailed knob of 18/10 stainless steel with antiqued brass finish. Bronzed stainless steel rim. Oven safe to 400 degrees. Hand wash. Being handcrafted, each will be unique and vary slightly. Imported. Saute pan has hand-glazed, heavy-gauge steel underbody. Hand-painted Courtly Check?? decoration. Bronzed stainless steel rim. 18/10 stainless steel knob with antiqued-brass finish. 21"W x 10.25"D x 6.75"T; holds 3 quarts. Hand wash. Imported.